Four-time Formula One World Champion Alain Prost has today (24 October 2013) joined forces with Jean-Paul Driot, founder of leading GP2 and Formula Renault 3.5 team Dams, to enter the FIA Formula E Championship - competing as new team e.dams. The new team launch, held at the L'Atelier Renault on the Champs-Elysées in Paris, was attended by racing legend Alain Prost and Jean-Paul Driot, together with FIA President Jean Todt and Alejandro Agag, CEO of series promoters Formula E Holdings. 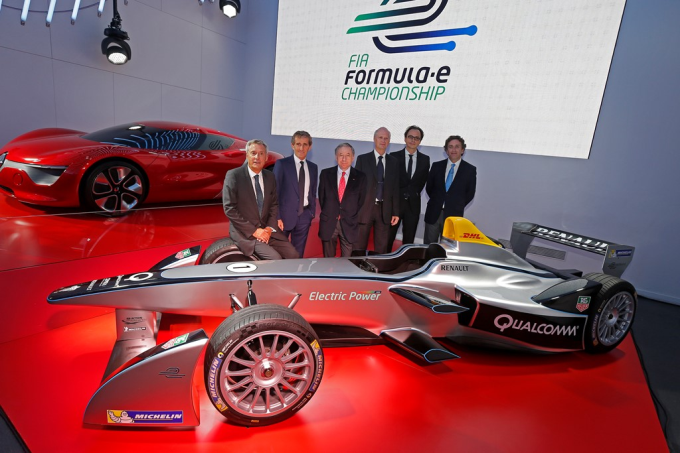 e.dams now becomes the fifth team to sign an agreement with Formula E Holdings to compete in the new fully-electric race series which begins in September 2014 and features 10 races through the heart of some of the world’s leading cities. e.dams joins leading IndyCar outfits Andretti Autosport and Dragon Racing, UK-based Drayson Racing and Chinese team China Racing as one of the 10 teams to be put forward to the FIA for final approval by its World Motor Sport Council. The new Formula E team will be supported with logistical and technical assistance by top European squad Dams (Driot Associés Motor Sport). Based near Le Mans, Dams boasts almost 25 years’ experience with numerous team and driver titles to its name including three International F3000 Championships, two A1GP titles, two Auto GP titles, two GP2 Asia titles and one team and two GP2 drivers’ titles. The squad has also expanded into Formula Renault 3.5 where last weekend it claimed the team and drivers’ title in only its second season.